As my day in the Fairbanks area came to an end, I thought it was the perfect opportunity to check out one of the city’s most well known and recommended attractions. Creamer’s Field is a former dairy operation that, thanks to a community effort, was transformed into a wildlife refuge. 250 acres of land provide a habitat for all sorts of critters, including numerous migrating birds. The land includes wetlands and subarctic forest – all in the middle of Fairbanks. The land isn’t the only thing that’s preserved here. 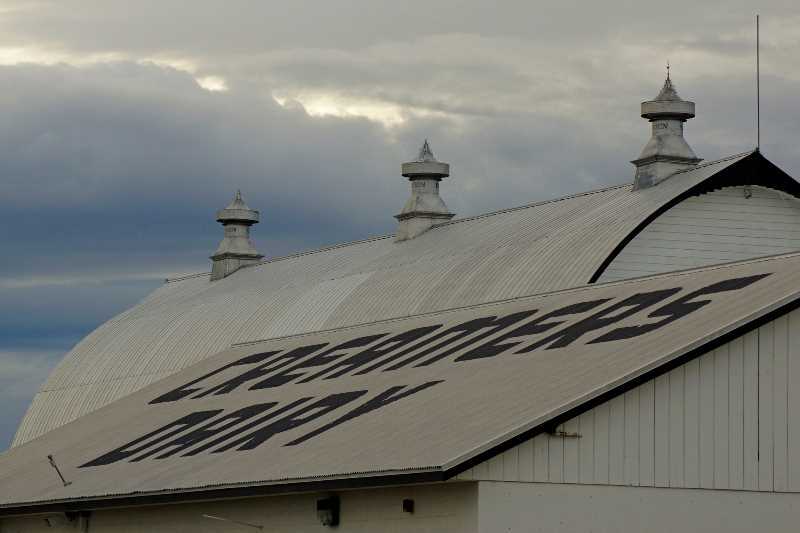 The old dairy farm buildings are also maintained, to provide a history lesson about the Creamer family (yes, the “Creamer” family ran a dairy) and the extraordinary measures it took to keep the farm running throughout the winter. For example, their delivery truck had a wood-burning stove in the back, to keep the milk from freezing. Park near the big old barn, and you’re also near the trailhead for several paths that wander around the property. None of the trails are challenging, and they all lead to something interesting – at least, if there happen to be birds or other wildlife around. The trails are lined with birdhouses, so there’s a good chance you’ll catch a glimpse of some smaller birds. I saw just one bird at the birdhouses. Then, I walked perhaps a half-mile, out to a viewing tower. A few birds were strutting around the field, foraging for food. …where I saw a squirrel. But I quickly realized that the most common creature at Creamer’s Field wasn’t a rodent or a bird, it was a mosquito. The refuge is doing a great job of protecting these little creatures. For the first time during my visit to Alaska, I was positively swarmed by the bugs. I had no choice to retreat. Almost back at the car, I managed to get a nice picture of a bird on a fence. … which give you some good spots to get fairly close to the birds in the field. There is also a small pond, further out, filled with ducks and some other birds. You’ll also have the chance to photograph some birds as they fly overhead. But like I said, I was getting eaten alive by Alaskan Mosquitoes. And it was late anyway. So I called it a night. My visit was late in the day, so all the facilities at Creamers Field State Migratory Waterfowl Refuge were already closed. If you arrive earlier in the day, you can visit the old farmhouse, which now serves as a visitor center and gift shop. During the summer, the farmhouse is staffed with volunteers from 10 a.m. to 5 p.m. daily. During the winter, it’s open on Saturdays from noon to 4 p.m.
How cold is too cold for wildlife viewing in Fairbanks? Creamers Field holds walks during the winter to search for tracks in the snow. The walks are canceled if the temperature is -30 degrees or colder. That’s minus thirty degrees. Creamer’s Field is located on College Road, on the north side of Fairbanks. From the Steese Highway (Alaska 2), take the Johansen Expressway west, then turn right onto College Road.